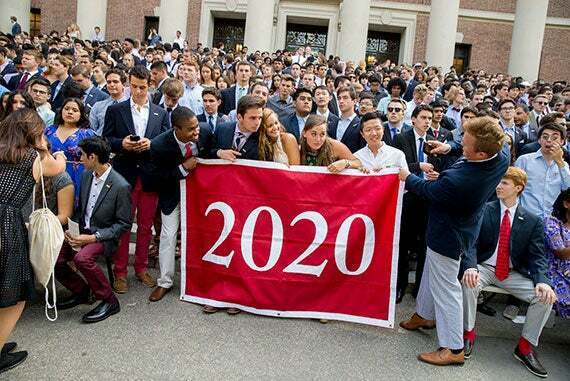 The class of 2020 kicked off their their time at Harvard in Tercentenary Theatre for Convocation and an official welcome from Drew Faust, center, president of Harvard University. Dean of Faculty Mike Smith is on left. Harvard President Drew Faust welcomed the College’s new crop of undergraduates during Freshman Convocation on Tuesday, urging them to embrace Veritas, with an eye toward inclusion and diversity, a goal of discovery, an openness to change, and a readiness to question assumptions and take chances. Fast becoming a beloved Harvard tradition with energy to rival the annual Commencement ceremony, the eight-year-old event took place in Tercentenary Theater under sunny, late-summer skies. Friends, classmates, faculty, and family cheered the students on as they processed through the Yard. Faust reminded the members of the class of 2020 that they enter college following a summer marred by violence in the United States and abroad. She encouraged her listeners to strive for a better world by rejecting ethnic, religious, and racial hatred and embracing inclusion. Other speakers also encouraged students to welcome diversity, to disagree and to connect with classmates, and to use their four years at Harvard to push themselves past their comfort zones, and to challenge their assumptions and beliefs. They also urged students to make new friends and to maintain a healthy skepticism. “I want to urge you to be skeptical. Yes, that is what we do in college,” said Rakesh Khurana, Danoff Dean of Harvard College. “That is what we do as educators. Ask questions, look for evidence, consider other points of view. But at the same time, I want you to remain idealists, to be skeptical idealists rather than cynics. Raise difficult questions, but also try to answer them. In her remarks, senior Emma Woo described an uncomfortable conversation with her roommate around religion. Disagreeing so profoundly “with a really good friend” was difficult, but the discussion deepened their relationship, said Woo, and helped her begin to re-evaluate her own worldview. She encouraged the freshmen to be open to such debate and self-reflection. Music was a key part of the festivities. The Harvard University Band opened the ceremony with “Fanfare for the Class of 2020,” a piece composed and conducted by Elena Sokoloski ’18. The Kuumba Singers, the Harvard Glee Club, the Radcliffe Choral Society, and the Harvard-Radcliffe Collegium Musicum also performed. As she made her way to the steps of Widener Library for the official class picture, freshman and Straus Hall resident Madison Trice of Houston said the day’s speakers inspired her. “I think all of the speeches were really, really powerful — talking about the differences between being skeptical and being open to different types of ideas and thought … and the idea of hope.